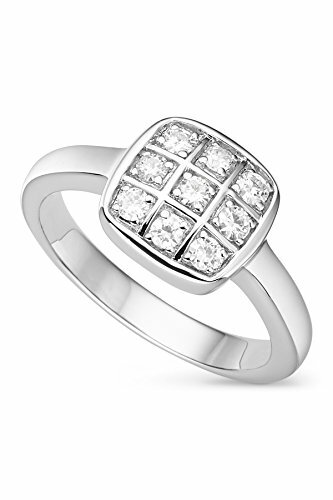 Charles & Colvard Created Forever Classic Moissanite illuminates in this checkerboard ring setting beautifully crafted in rhodium-platedsterling silver. Total Diamond Equivalent Weight (DEW) is 0.23cttw (Actual Weight 0.19cttw). Ring size 7. Charles & Colvard Created Forever Classic Moissanite illuminates in this checkerboard ring setting beautifully crafted in rhodium-platedsterling silver. Total Diamond Equivalent Weight (DEW) is 0.23cttw (Actual Weight 0.19cttw).